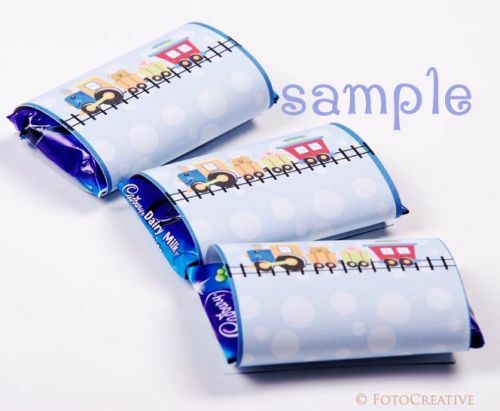 Our chocolate bar wrappers are designed to fit standard snack size chocolate bars. Each wrapper is printed to co-ordinate with the invitations you are purchasing. If you are not purchasing invitations but would like us to customise the wrappers to match the theme of your party, we can do that. We'll email you after your order is placed to find out your party plans. Simply wrap the wrapper around the chocolate bar and fasten at the back with sellotape.